The army of the heavens marches into Washington, D.C., and marches out of Washington, D.C. … [and soon] they go into North Korea. The Museum of the Bible opened last year on November 17 in Washington D.C., just a few blocks from the white house. Steve Green, the president of Hobby Lobby, funded the museum. Green is known for being a staunch conservative who challenged Obama era regulations requiring employers had to provide contraception coverage to employees. Green has experience when it comes to using his faith to influence politicians. I don’t begrudge him for that. It’s naïve to think Christians, or any person of faith, can detach themselves from their faith when it comes to politics. For me, the important question for Christians is, “What kind of faith do we have?” Because we can have a faith that’s based either on sacrifice or on mercy. After all, Jesus scandalized some of the religious leaders of his day on this very point. When asked why he hung out with sinners and tax collectors, Jesus quoted the prophet Hosea as he responded, “Go and learn what this means, ‘I desire mercy, not sacrifice.’” Jesus was not neutral in the way he lived his life or interpreted scripture. He emphasized mercy and love, not violence and sacrifice. 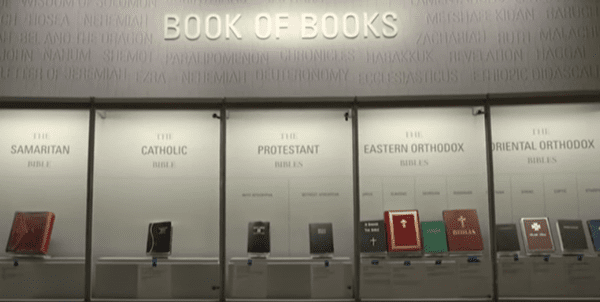 Does the Museum of the Bible Have an Agenda? The problem is that the Bible has a difficult time making itself heard! We all bring an interpretive lens to the Bible, and so much of our lens tends to be based on sacrifice. We have a tendency to divide the world up into good guys and bad guys, where we are the good guys who need to kill our enemies. That’s how we tend to believe peace will be achieved. It’s the way of sacrifice that has been with us from the beginning of human history. But Jesus came to change all of that. Steve Green may want us to believe that the Museum of the Bible is neutral, but Jesus wasn’t neutral. Following the prophet Hosea, Jesus said that God doesn’t desire sacrifice or violence. Rather, God desires nonviolent self-giving love. Christian nationalism is a sacrificial form of Christianity. It goes against everything Jesus stood for by dividing the world up into good guys and bad guys who must be killed or otherwise defeated. The museum does this in a subtle way. I have not been to the museum, but according to the article, the tribute to the Bible’s influence on American history is on full display. It’s important to learn how the Bible has influenced Western culture, and the United States in particular. But what I find troubling is that the museum promotes Christian nationalism by inviting certain speakers to lecture at the museum. Jacobs has also claimed that Donald Trump, “Will be seated and mantled with the power of God.” You know, because Trump’s red button is bigger than anyone else’s. It’s big. Big. BIG! I shook my head as I read the article in the New York Times. How could anyone get Jesus’s emphasis of mercy, not sacrifice, so wrong? I’m afraid that this is what happens when Christians try to “let the Bible speak for itself.” We read into the Bible our sacrificial interpretation and so we manipulate the Bible into speaking for us and endorsing our sacrificial understanding of God. But the Bible moves away from sacrificial violence. Yes, there are violent passages in the Bible. Some of those passages are horrific. But those passages are subverted from within. I’ve already mentioned Hosea’s statement that God desires mercy, not sacrifice. But look at the near-sacrifice of Isaac. Abraham was called by God to sacrifice his son Isaac – or so he thought! Abraham was willing to obey, but just before he was about to perform the sacrifice, an angel of the Lord told him to stop. God intervened to correct Abraham’s misunderstanding. Abraham is the founder of the Judeo-Christian faith because he chose mercy, leading the world down the path of ending human sacrifice. This leads me to “Penal Substitutionary Atonement.” It’s a theory that claims Jesus took the wrath of the Father upon himself to save us from God’s anger. This theory is a modern-day Protestant heresy. The early church didn’t believe it. The first time the idea that the cross had anything to do with “wrath” came with the Protestant Reformation. Jesus didn’t come to save us from God’s wrath. He came to show us God’s eternal love. For even if we crucify Jesus, God in Christ offers us forgiveness on the cross and peace in the resurrection. Jesus didn’t come to save us from the wrath of God. But he did come to save us from wrath – human wrath. Jesus took human violence upon himself in order to transform the way we relate to one another. We often relate to one another with violence. God became human that humans might become like God, as the early church put it. And if Jesus is the concrete revelation of who God is, then to be like God is to live a life of forgiveness and all-embracing love. Are you interested in a conversation on this topic? Join Suzanne Ross and me live this Friday at 2:00 CT on the Raven Foundation Facebook page with your comments and questions about the Museum of the Bible!